I give this Record top marks because it's so different than the original release !! God FORBID ! so each take they did, was completely different. The music beds, were naked, no effects on them. So when they put together this version, they had to improvise and leave out things they no longer had in their possession like the random library sound effects they used on the fly in 1966. What this is essentially is Psychedelic Moods 'the naked mix' or the Psychedelic Folk version. It's got a different vibe but it is still the same tracks. Some tracks have alternate vocal takes. It's an overall punchy mix and lots of surprises that were originally buried in the original release. The LP version is superior to the CD release. Well worth the price for this 1st official remix /reissue of the album, put together by Rusty Evans and Mark Barkhan. I don't see the Canadian mixes on this album.. so a bit of false advertising (I'm being cheeky) . No Matter, I assume these are the same takes Rusty released several times in the 80s on Collectables over 5-6 volumes. Would have been nice to see the inclusion of the nucleus of what became "the deep" with Rusty Evans (marcus) recordings for Musicor which were blue print for this instead of the Hydro Pyro tracks, which are decent, but to represent "THE DEEP" it should be Rusty's vision, not Barkan's. Again collectables did this routine already this stuff. 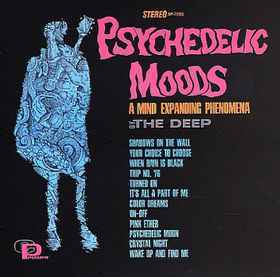 Rusty went with this group including Bromburg, and got a deal with Columbia to record "the Freak Scene" right after the Deep, that's why "inner sanctum" is not the proper context to include on this comp, it should be the Freak Scene and takes from Psychedelic Psoul, they were the DEEP. Right after the "Freak Scene" Rusty went back out west and worked on the "Fifth Pipe Dream" album, which is another link but another story. One of the greatest of "Collectables" Deep reissues is the first volume ,which is a the master tapes, without all the sound effects laid over (they must have been mixed in live in various takes - the Canadian mix shows different placement of the effects) and some instruments stronger in the mix than others. Volume 2 on collectables is really nice acid garage comp, that has no tracks from the Deep, it's the showcase for the Mono mix of Hydro Pyro on Mercury reecords, but it's the tacked on rare 45s that are the standouts on VOL 2, all tracks have no connection to Rusty Evans or Mark Barkan. A live version of Signed D.C. by the Fallen Angels is worth the price of the album, and 2 sides from Rear Exit is just the cherry on top. Are the mixes of the Inner Sanctum sessions the same Mono mix downs? Made from dreaded remixed version...bad Void pressing on top of that makes this one barely listenable. Lion 3XLP is the ONLY way to go if you're not buying an original. Absolutely love this album and this reissue is superb in every way. Commercial copies found with No DJ PROMO stamps or stickers. Quality records sticker so far on all Canadian copies seen. Stereo version elusive, if it even exists. Cover slick has Stereo Printed wrapped around back of Mono..but unknown if those are from USA print run used in Canadian distro. Unknown if was released commercially in Canada as so far only DJ PROMO MONO copies have surfaced. Unknown if Stereo mix exists. As noted, and is very interesting, this is a different mix than the USA version. sound FX but not dramatically - same sound FX just placed in slightly different timing. A unique reverb sound is heard throughout. Not as punchy in the low end if I compare it to the USA mono pressing. How to ruin the greatest psychedelic LP ever made. This was the issue that lost half the stereo mix somewhere and removed all the mental sound fx. Avoid.